Finding the best nerf gun isn’t easy. One of the best things about Nerf is that they have a massive variety of different guns and blasters, but this can also make it difficult to know where to begin. With so many different Nerf guns available, which one should you choose? It really depends on what you’re looking for. Some guns tend to appeal to those looking for something practical and small, whereas some people just want the biggest gun they can get their hands on to shoot as many people as possible. And others like to collect as many Nerf guns as possible, even if it means that you’re not going to use it too much. 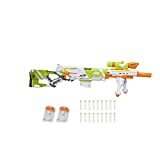 All in all, you should take a little time and do some research to try and find out really what the best Nerf gun for you might be. They all have different functions and capacities, so this is definitely something you’ll want to consider. If you’re in a rush, I’ve listed my 5 favorite Nerf guns here for you to choose from. 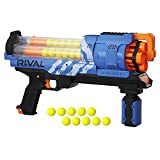 Nerf Rival Series – Best Nerf Rival Gun? Nerf N Strike Elite Disruptor – The Best cheap entry level Nerf pistol. Nerf N Strike Modulus LongStrike – Awesome for Long-Range Shooting and Add-Ons. 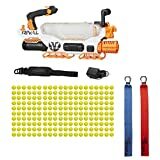 Nerf Rival Prometheus – Best Nerf Rival Gun, amazing 200+ round high capacity to blow people away. For serious Nerfers. Nerf N Strike Mega BigShock – Great for One in the Chamber, one shot duels. 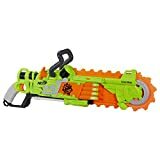 Nerf Zombie Strike Crosscut – Cool for kids, with an awesome fun chainsaw action. 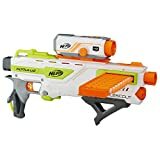 Overall, this is just a short roundup of some of my favorite Nerf guns that have been released in recent years. This certainly isn’t everything, and there’s a ton of other guns that we’re going to take a look at. So, let’s look at some of the top Nerf guns! The Nerf N Strike Series is what really put Nerf on the map. Though they were released in the nineties, as soon as the N Strike series was released in 2003-04, they became immediately popular. Though the original Nerf Strike Series isn’t around anymore (it was discontinued in 2013), it did spawn three series that are still selling well. The N Strike Elite is the biggest collection of them all, with other 60 different products to choose from (about 35 of the entire collection are guns, the rest are accessories). The Nerf N Strike Elite collection is pretty awesome. The N Strike Series takes on the typical blue coloring, and when you think about what a Nerf gun should look like, the Elite Series is a pretty stereotypical example. Out of the 35 guns that make up the Nerf N Strike Elite Series, there are a few that stand out in comparison to the rest. One of the best small Nerf blasters that they’ve released in recent years is undoubtedly the Nerf Disruptor. 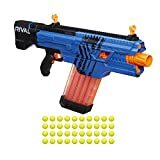 The Disruptor is proof that you don’t need to spend a fortune on Nerf guns, as you can usually find it cheaper than $15 online. For close range action, larger guns aren’t really ideal as you have to work to manoeuvre them. In general, smaller guns like the Disruptor are far more fun to use. Plus, thing this really has some range on it, too. I recently purchased an extra Nerf Disruptor, mainly because it was so damn cheap! You can check out my individual review of the Disruptor for a more in depth look. In my opinion, the Disruptor is the better choice out of these two different Nerf guns. But for some people, they seem to prefer the strong arm blaster. They’re both relatively decent guns, and they’re very inexpensive too. One good thing about the Strongarm is that it’s particularly easy to reload. It only has a 6 dart reload clip, which is really easy to use and flip open. Like the Disruptor, it’s surprisingly powerful for it’s small size and can certainly hold it’s own with some of the bigger nerf guns. The Rampage is one of the better Elite models that holds more than single fire ammo. It holds 25 darts, which makes it great to fire. In terms of rapid fire blasting, it’s up there with the best of them. It’s actually one of the only large ammo guns that isn’t automatic – yep, this one is completely manual. So, you’ll need to keep sliding the handle up and down to ensure you’ve got enough pressure to fire as fast as you’re able to. It;s undoubtedly one of the fast guns out there that isn’t battery powered. The Terrascout is definitely the most unique Nerf gun ever. From a distance, you wouldn’t even know it was a Nerf gun. It’s actually a robot, which a Nerf gun attached to the top of the battlebot. The reality is that this is more of a gimmick than a practical Nerf gun, but when it was released it was really fun to use. If you’re looking for a Nerf gun, this likely wouldn’t be a great choice for you. If you want a fully automatic nerf gun, then you could decide to opt for the Rapidstrike. 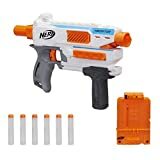 It’s one of the best fully automatic Nerf guns, second for me only to the Regulator (which I’ll get to a little later on), because with the Regulator, you get the option to switch to single fire. 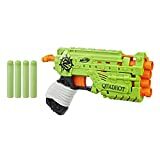 The Rapidstrike is a typical shoulder shot nerf gun, and it comes with 18 darts to fit in the 18 dart clip that it holds. To use it, you will need to use it with batteries to get the automatic effect. Many people have heard of the Stryfe, it’s one of Nerfs bestsellers. This is no surprise. It has a surprisingly good amount of firepower seeing as it’s a smaller, one handed blaster. When you’re ready to shoot, you can start pressing the acceleration trigger and this will start to power up the motor, which eventually leads to complete destruction. It only hold 6 bullets in the quick reload clip, but they do fire fast, which makes it one of the best choice for close range combat. The Stryfe is a favorite amongst Nerf fans, and if you can get your hands on one, then go ahead. But, it’s currently discontinued, and this could see you paying stupid prices, so shop around on Amazon if you can. 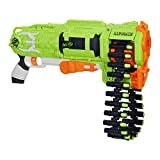 If you ant a battle effective spring power blaster, then you’ll probably want to look at the Elite Alpha Trooper (sometimes referred to as the Nerf E.A.T). When it was released, it was made exclusive to certain stores (e.g. only Target, or only Argos in the United Kingdom). The Elite Alpha Trooper is currently discontinued, which means you’re not going to be able to find it online easily without paying a surplus. Don’t worry, there are plenty of other blasters out there to choose from. That rounds up the best of the N Strike Elite Series. But, that wasn’t the only series to be spawned from the original N Strike Series. No, there are actually two other series that produced some pretty awesome nerf guns. 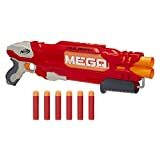 The Nerf Mega Series are pretty much exactly as it sounds – they’re the evolution of Nerf guns, and they’re ultimately a more powerful option than the Elite Series. There aren’t as many options in the Mega Series, though some of them are pretty awesome. The BigShock sounds like it’s going to be some big, two foot behemoth of a gun that’s going to be fully automatic. But the reality? It’s a small, one shot pistol blaster that’s relatively simple and unique. It has a one up top, one down below clip – meaning there’s one in the chamber you can fire, and one extra bullet than you can quickly reload with placed on top of the gun. This is a great gun for doing cowboy duels with, which is one of my favorite Nerf war games to play. It’s also really cheap, making it a pretty good first Nerf gun. 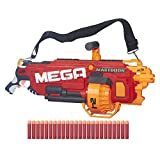 The Nerf Mega Mastodon is one of the bulkier releases of the Mega series. It comes with a 24 dart rotating drum which is ideal for rapid fire. Although the gun itself is particularly bulky, it does come with a strap and it’s intended to be used like a minigun. It requires 6 batteries to work, which shows just how powerful the gun can be. It’s really a different class of gun that the majority that I’ve already mentioned – if you want to feel like Scarface, then this is a great gun for that. If you want to use a pump action blaster, then the Doublebreach is the best example of this. It was only released in 2017, so it is one of the newer models that’s become extremely popular. It’s really slow to reload (like any shotgun type of toy), but it’s actually quite long distance, even though it isn’t intended to be aimed in the same way as a regular Nerf gun. If you want to get a Nerf gun that really has that shotgun feel, then the Doublebreach is undoubtedly a really good example of that. The Magnus is a three shot pistol that actually keeps all of the darts internally, which is pretty cool for a pistol. Although it’s on the larger side, it’s pretty lightweight and it has a really good range for firing power. Although it’s been discontinued, you can actually still find the Magnus available in certain retails stores around the country. If you’re looking for a pistol with more than one shot, then the Magnus is undoubtedly the way that you’re going to want to go. 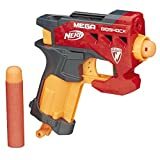 Undoubtedly one of the most practical guns that Nerf has ever released is the Nerf Mega Rotofury. It’s an awesome blaster that packs 10 Mega Whistler darts, which you an fire in quick succession without reloading. It’s really good as a pump action single fire gun, and there aren’t too many others out there that can match it in terms of quality and power. Of course, here I’m talking about Nerf guns. But, the Nerf Mega Thunderbow was undoubtedly one of the best Nerf Bows that’s actually been released, if not the very best. The final part of the N Strike Series is the Modulus. Released in 2015, the Modulus is ideal for anyone looking for a step up in quality of their Nerf guns. They’re very easy to upgrade and add accessories too, which make them awesome and a level up from the average Nerf gun. If you’re looking for an awesome Nerf Sniper, then the Longstrike is going to be one of your best options for this. It’s got some awesome range on it, What really makes the Longstrike one of the best nerf snipers is the customization that you get with the Modulus series. Historically, the Longstrike didn’t really live up to it’s name in the past. But with this, it all changes. It’s actually accurate to around 30 feet – any longer than that and you’re going to struggle. But for a Nerf gun, this type of accuracy is awesome. You’re able to easily customise the Longstrike too, making it even better. You’re easily able to fire off 6 shots at a time with the Longstrike, making it an awesome choice for a long range nerf. The Nerf Modulus Mediator is the Modulus Ranges answer to a pistol. Except, it’s not really a pistol, it’s more of a pistol/shotgun hybrid. It’s pump action, which means it’s a lot louder than other nerf guns out there. For a smaller nerf gun, one thing that will particularly impress you is that it has 6 bullet (which is great if you compare it to the BigShock. The main attraction point to the Modulus Mediator is really the price point. When a Nerf gun is around the $10 mark, it’s usually not going to be the most powerful – but that doesn’t mean it’s not going to be the most fun. For close range action, this is an awesome Nerf gun. The Battlescout is another pump action like most of the Modulus series. It’s a 10 darter, but what’s really interesting about this model is that it has a HD camera on the top. For the camera to work, you’re going to need to use 4 batteries with it. Whilst the camera addition is a good idea from Hasbro, it isn’t the best camera in the world. It’s a bit more of a gimmick, like the Terrascout. But if you’re looking for something a little different, then the Battlescout is definitely that. The demolisher was only released in the second half of 2018, and already it looks to be one of Nerf’s more interesting models. It’s a 2-in-1, so it can fire both darts and missiles. It has a ten dart banana clip, which makes it really easy to reload. With the missile blasting, this is completely powered by pump action. But for the dart themselves, this is all motorized, which you can control easily with the trigger. It’s got really good range for a Nerf, with ranges of up to 90-100 feet possible with angled shooting. The Nerf Modulus Series of one of the most popular series currently, the main reason being is that you get the ability to actually customize your gun with several different accessories. Here’s just a few of those accessories, although there’s many more available. Nerf Modulus Day/Night Scope – This scope is ideal for any of the Modulus Nerf guns with long range, as it allows you up to 5x magnfication on what you’re already seeing. You can easily attach it to the tactical rails at the top of the scope that all Modulus models have – it has a cool infrared mode too. Stealth Ops Kit – The Stealth Ops Upgrade Kit is awesome if you want a cheap add on that gives you a ton of fun. It has a red dot sight, proximity barrel which helps to increase your accuracy and an additional pivot grip which makes it easier to keep your gun sturdy. Long Range Kit – This kit allows you the ability to shoot long range, which is great for larger guns. It has a folding bipod, which really gives you the feeling that you’re going to be doing some real shooting. Flip Clip – If you’re tired of only having one round to fire on your enemies with, then a flip clip is ideal. It’s really easy to change the clips over, which prove useful for fast firing combat. The Modulus is undoubtedly one of the best series that Nerf have released so far. There are other series for you to consider, however. The Nerf Zombie Strike Series is exactly as it sounds. Nerf released this set so that you can attack the potential zombie hoard that might arrive at any moment. As well as these Nerf guns, they also released some melee weapons to be used alongside them. The Ripchain is a good option if you’re looking for something that really looks the part. Although from it’s appearance it may seem to be a battery powered Nerf gun, it isn’t – it focusses solely on pump action. It used mega whistler darts, which are good for long range shooting. 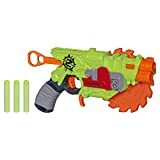 It has a 25 dart chain, which makes it a little different to many other Nerf gun models. With the 25 darts, you either have the option of firing them one by one on their own, or you can use the pump action and blast out all 25 within quick succession. Either way, if you want a large ammo Nerf gun without having to constantly replenish batteries, this is a great choice. The Nerf Roughcut Blaster was one of the more popular Nerf Elite Series guns when it was originally released. Now, the Brainsaw is essentially a Roughcut Blaster with a chainsaw style add on that makes it look super cool. There’s nothing wrong with that, as Nerf have updated their guns often to give us more exciting options throughout the years. The Brainsaw actually has an awesome chainsaw mechanism that works well. Though if we’re completely honest, this gun is more for show than anything else. And whilst the chainsaw part of it is actually made from foam, it’s surrounded by plastic – meaning you’re likely just going to poke someone with a big hunk of plastic. The Quadrot was only released on the 1st January 2019, so it’s really new to the market. General consensus seems to be favourable towards the Quadrot however, and it’s worth looking at if you want a pistol with multiple darts. It’s really easy to set the gun up with the plunger pull, and it has the four dart shooting, which is the most of any Nerf small pistol so far. It isn’t particularly powerful, but that doesn’t mean you should dismiss the Quadrot. Another zombie option like the Brainsaw is the Crosscut – it’s generally half the price of the Brainsaw, so it’s definitely worth thinking about this one instead. The saw isn’t particularly usable on either item and it’s more of a showpiece, but it is fun to play with for younger kids. For it’s relatively low price, the Crosscut represents a pretty good deal for what it’s worth. The Zombie Strike Series are releasing new guns often, so it’s worth keeping your eyes on them. The other Nerf line I’m about to mention is also extremely popular – I’m talking of course, about the Nerf Rival series. The Nerf Rival series is probably the best option for adults, as it’s designed with teenagers or older in mind. It isn’t really suitable for young kids, and was even banned in Australia because they didn’t meet toy requirements. Instead of firing darts, the Nerf Rival series used small golf ball style (but not as hard as golf balls, obviously – this is good for firing long distances and using in more competitive Nerf matches. Up until 2018, the Nemesis was the king amongst Nerf Rival guns. It had 100 round capacity, which means that you could easily run into a crowd of people and blow everyone away. It was the best Nerf rival gun on the market.. until the Prometheus showed up. Now, the Prometheus is the biggest, baddest Nerf gun around. Sure, it’s expensive for a Nerf gun. But with it, you’re getting the capability to fire 200+ Nerf balls at your opponent, making it the highest Nerf gun capacity ever by some distance. As you might have guessed, it’s a big gun and it’s extremely powerful and fires at 100 feet per second. This is a great choice for the serious Nerfer. If you want something that’s battery powered, fully automatic and flywheel, the the Khaos is probably something that will interest you. Did I mention it can take 40 rounds, too? Whilst it can be a little difficult to reload (come on, it’s 40 rounds), this one offers possibly the most fun of any blaster. It’s super high capacity make it really fun to use. Plus, you can pick up a rechargeable battery pack too and not have to worry about the 6 batteries it would usually take to use. The Khaos holds 40 rounds sure, but it’s a big and bulky gun. If you want to compromise your rounds slightly and get a gun that’s much smaller, then the Artemis would likely be your best option for this. It holds 30 rounds in 3 separate 10 clip mags, but they’re all built into the gun internally, which helps to minimize the size of the gun. It’s really easy to reload, and in my opinion, it’s one of the best examples of what the Rival Series should be. If you have a bigger budget and want the ultimate option in capacity, then the Nemesis is the choice for you. It takes 100 rounds or more – yes, that’s right, 100 rounds. This is really what many Nerf fans had been waiting for for a while. It’s a gun where you can run into a crowd of opponents and really blow them all away. It’s fully automatic too, but it doesn’t use spring action. The balls naturally fall onto the flywheel, ready for firing. Aside from the expensive price, this is an undoubtable favorite for best nerf gun ever. The Atlas is a good option if you’re looking for a Nerf shotgun. It’s actually a double fire Nerf gun, which in my opinion, doesn’t make ideal for the Nerf Rival Series. It only holds 12 in the clip, and as it’s double shot, that means you’re going to only get 6 shots. This isn’t enough in my opinion for a big gun like the Rival Atlas, so I’d look elsewhere. Unless you desperately want a shotgun however – then this might make a good choice. The Nerf Zeus and Apollo were the first two Nerf Rival guns to be released. For that reason, they can be a little harder to find than newer models. If you can get your hands on a Zeus, then it’s definitely worth it. But in my opinion, your best bet is to go for a newer model. Nerf released a few different accessories with the Rival Series, but the main one you want to be aware of is the additional battery pack. This works in the Khaos and the Nemesis, and unless you already have 6 D Style rechargeable batteries that work, then you’re better off picking up a battery pack too. This makes things a lot easier, and you won’t end up running through a ton of different batteries. Finally, we’ll take a quick look at some of the guns from the discontinued Nerf Rebelle series. Now discontinued, when it was released the Rebelle line caused some controversy due to the fact that it was pink and for girls. Whilst Nerf guns are generally gender neutral anyway, Hasbro decided to release some pink fluffy ones that girls might prefer. Whilst the line wasn’t too successful, they did release some cool guns. The Rapid Red Blaster is one of the better nerf guns that they released from the Rebelle line. It’s battery operated, but only 4 AA batteries, so it’s not as powerful as some guns. But, it’s relatively small in comparison. The Rapid Red Blaster is basically the female created equivalent of the Stryfe, which is why it proved to be so popular with Nerf fans. Whilst the idea of the Cornersight seemed really cool, it didn’t do particularly well. This was largely due to the lack of firepower, in which it was basically a Nerf Jolt, which is known for being one of the worst firing Nerf guns to use. It’s made to feel like a revolver, and whilst it looks cool, it isn’t particularly practical. BOOMco are generally considered as the second in command to Nerf guns. Whilst Nerf are the originally foam dart brand and always will be, there’s no denying that BOOMco have also released some super cool guns over the last couple of years. The coolest, in my opinion, of the BOOMco range is their released of the Halo gun replicas. They’re surprisingly accurate to the real thing, and it’s worth looking at them if you’re fed up with Nerf. The Reality is with the Halo line is that the majority of the weapons work better as show pieces. They’re really cool to hold and look at, but most of them aren’t that practical. I’ll give you my opinion on what I think the most practical Halo guns are. The Needler in game compared to the replica Needler made by BOOMco. Pretty cool, and the ammo on top of the gun lights up as well. Halo powered by BOOMco. brings the intimidating Brute Spiker to life! As a pistol, the Brute Spiker blaster is one of the better options from the BOOMco Halo set. It’s relatively cheap too, which makes it a no brainer for me. The Spiker Blaster uses a 6 dart clip system, all you need to do is prime the blaster by pulling back the handle on the top. Of all the Halo guns, I think that this one provides the best value for money. This is another good example of a relatively decent gun. It isn’t the most practical, and it probably isn’t as good as most other Nerf and BOOMco guns if we’re talking about firepower. But because it’s a replica of the Halo Assault Rifle, it does look really like the Halo Assault Rifle. So, it’s worth purchasing if you’re an avid Halo fan. It seemed like with this series, the smaller guns were the more practical. Whereas the larger guns were really just for show purposes. The M6 Blaster is a good example of a cheap blaster that still carries the Halo name and it true to the in game version of the gun. Covenant Needler – Undoubtedly the coolest looking in my opinion, the Needler holds pretty close to the game. The gun itself isn’t the most practical however, and for such a big gun, it doesn’t have great capacity. Plasma Gun – Again, one of the best guns to use in the game itself and the replica does feel really good too. However in terms of firepower, it’s pretty lacklustre. Covenant Carbine – For some reason, BOOMco made the Cov Carbine really, really small in comparison to what most fans thought it should be. Firing, it isn’t bad but it’s not up there with the best. Before you go ahead and actually purchase a Nerf gun, you;ll want to take a few things into consideration before you do so. Nerf guns can go from super big to super small. Personally, for practicality reasons I much prefer the smaller guns, though they tend to have a lower capacity. This means it’s going to take you a lot longer to reload with a small low capacity gun than a big one. But, the big ones have their drawbacks too. They can be heavy, harder to aim and they’re not great for quick sneak attacks. For me, this is the most important thing that you’re going to have to consider. 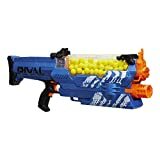 You’ll find Nerf guns with as little capacity as 1 dart, or you’ll find the Nemesis, which you can load over 100 Nerf balls into it. The whole ‘more is better’ thing isn’t always the case with Nerf guns. Because with guns like the Nemesis, if you’re playing outside, you are going to lose balls. That’s just a fact of playing Nerf. Especially with the Rival Series, which I’ll talk more about now. Another thing that the Rival series brought in that might make your decision a little more difficult is the use of balls as opposed to darts. 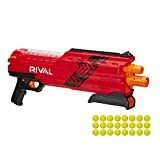 Whilst other Nerf guns still use darts, the Rival series uses small balls to fire at your opponent. These are great for velocity, but they do get lost a lot easier in my experience, so that’s something to bear in mind. Price is another thing you’ll want to consider. If you’re new to Nerf, then make sure you do your research and you’re not paying too much for guns. There’s a lot of resellers online selling the older models that have been discontinued for two or even three times the price. That means you should try and stick to a model that hasn’t been discontinued yet, so that you can get it at it’s retail. If you’re picking out Nerf guns for the whole family, then you might want to consider different colors so you can pick teams. For example, the Rival Series has blue and red colors, so you can easily differentiate between the two. Usually, these bright colors are used so that we don’t get them confused with real firearms. Of course, something many people are concerned with is the firepower. Generally, Nerf guns tend to shoot around on average 60 feet per second (about 20 meters per second, or 40 miles per hour). There isn’t a ton of variance between the guns, but larger battery powered Nerfs do tend to have a faster shot. If you’re not the best at Nerf and you want to improve your Nerf game, then here’s a few tips that can help you to improve your Nerf abilities. Use your ammo carefully – Often, people blitz their ammo straight away within the first minute. By being a bit more conservative with your ammo, you’re giving yourself a better chance later down the line. Try using a lighter gun – People get attracted to the big and bulky guns because they look cool and they think they’ll never run out of ammo. This isn’t necessarily the case, and sometimes smaller guns can prove to be the best option. Don’t be too fancy – Whenever I’m playing Nerf, there’s always someone that thinks they’re a ninja. Stealthing around the field, thinking no-one notices them. We all see you! Nerf is mean to be a blast ’em game, so don’t be afraid to go in all guns blazing. Overall, this is just my opinion on some of the best Nerf guns that have been released over the years. It’s really down to you to decide on what may suit you. If you aren’t entirely sure, it’s probably a good idea to pick up a good mid size gun along with a cheap pistol gun. This way, you can get a feel for the guns and you’ll be able to tell which one is going to be most suited to your needs. There are a ton of different Nerf guns that have been released, and even some this year, so don’t be afraid to wait to find one that you really like. And remember; it’s Nerf or Nothin!